We've seen a significant shift in in the competitive landscape for BPO providers in the last two years - some of the leading Indian service providers have taken advantage of the Recession to steal a march on several of their incumbent competitors, pushing their own tenacious brand of offshore service delivery. The change has been dramatic, with some of the traditional providers of recent years being knocked off their perch. When HfS produces its new competitive landscape later this year, this market shift away from some of the "traditional" BPO engagements and momentum towards new approaches for pricing, engagement scope and IT-synergy will be apparent. One of those providers which has evolved significantly into a major BPO provider, in its own right, is Tata Consultancy Services (TCS). Like a couple of the other major Indian IT services providers, TCS has quietly, but aggressively, developed a global operation of scale at a rapid clip, with its 2008 acquisition of Citigroup's banking captive adding significant offshore BPO scale and financial services competency to its $1.2 billion mammoth multi-tower IT-BPO-KPO engagement with Nielsen in 2007. Quite simply, it's eye-opening how quickly the likes of Infosys, TCS and Wipro have muscled in on the business process game, as they branch out from their massive IT services businesses. To discuss this dynamic at length, we managed to grab some time with TCS's head BPO honcho, Abid Ali Neemuchwala - (more simply known in the business as "Abid") to talk about TCS's development, and his views for the future nature and development of global BPO service delivery. Phil Fersht: Good morning Abid. Let’s start with where TCS is today, how things have changed in the last six months, where you see the majority of demand coming from and how the business is shaping up. Abid Ali: Phil, we ended our financial year on March 31 with about $720 million in pure BPO revenues. TCS overall is $6.7 billion, so our BPO revenue is now more than 11 percent of the TCS revenue pie. Last year was very successful and rewarding for us, which means our strategy has been playing out well throughout the downturn and the recent upturn. From a market perspective, I continue to see very good uptake in transaction processing in the verticals. We’re especially seeing a lot of activity in banking and financial services, accelerated by our Citigroup acquisition, which gave us some unparalleled capability. We also see a lot of activity in the insurance vertical. For that sector, we embarked on licensing on three key aspects of transaction processing in the U.S….collections, mortgage origination and third party administration licenses. This is quite complex because all the licenses for each of these streams are administered at an individual state level. So acquiring these licenses positions us as a committed and serious insurance industry player. We also continue to see traction in the pharma space, both vertical and horizontal. Most of our new client acquisitions have happened based on the IT-BPO synergy proposition. And if you look at all the deals we have won in the last 12 or 18 months, about 70 percent of those have come from cross-selling to existing IT customers. That works very well for an organization like TCS because we have strong C-suite relationships and so are able to position ourselves very well. If you look at TCS’s growth over the past 20-25 years, account mining has been our strength. This many times makes our cost of sale lower, makes it easier for us to penetrate, sometimes makes deal closure much faster. Especially in the recession when a formal bidding process was taking anywhere between nine to 12 months, we saw certain deal closures in three to four months simply because we were cross selling into existing accounts. Over the last six months, we have seen many relatively small deals coming up. We have not seen too many big bang $300-500 million deals, but the smaller deals -- $50-%70 million – plays well to our strategy of penetration, establishing track record and then growing within the account once we prove our capabilities and are able to cross sell and up sell our offerings. Phil Fersht: You mentioned 70 percent of your business in the last year has come through cross selling into IT clients. Does that signify that more BPO discussions are arising around industry-specific processes at this point, or are you seeing more horizontal BPO business opportunities? Abid Ali: We are definitely seeing much more vertical process interest in the market. Many of the cross-sold deals have been in core domain areas. And more than 50 percent of those deals are cases where we either developed the IT application or we were supporting the customer’s application enabling that particular vertical process that we took over in the BPO area. So our domain knowledge and understanding of the customer’s process is playing to our advantage in those deals. We are also seeing a fair amount of horizontal deals, but more of them are still coming in through the traditional bidding process. The vertical processes are the ones coming more as cross-sell opportunities from IT into BPO. Phil Fersht: Our recent discussions with the buy-side on vertical focused processes, have shown common concensus that the next wave of optimization comes through IT-enabling the process within the outsourced environment. So when you talk about cross selling into the IT customer base, I immediately think about 'vertical processes'. You mentioned taking on customer applications and delivering the process around them in vertical areas. Would you say most of your vertical business is taking on the customer’s existing IT platform, or are you actually pushing your own application IP into the client base? Abid Ali: In verticals, we have developed some of our own very focused platforms, most of the vertical processes we deliver are on our customer platforms. And in most of those cases, we support it from an IT standpoint. We have a platform for U.K. Life and Pensions companies which originally germinated from our Diligenta/Pearl Group deal, and we now have a couple of additional customers on that platform. Another of our platforms, which we call Aspire, is for reconciliations. We started that about three years back with our Deutsche Bank deal, and have about four other customers on that. Our third platform, which includes solutions from our acquisitions of TKS in Switzerland and FNS in Australia, is our BaNCS products for the banking industry. On the horizontal side, we are seeing a lot more traction on going in with our own modular technology platforms, whether it is F&A, supply chain, HR or analytics. Phil Fersht: One thing we are seeing this year is more sole-sourced activity and less involvement with the competitive sourcing advisory process, particularly with the vertical deals. Is that something you are seeing as well? Abid Ali: Yes, especially when I look at the vertical business and deals we are able to cross sell. We are able to proactively go to our client and say, “You have this process. This is what your process matrix looks like. This is what our best in class industry process is, this is what we think the process matrix should look like based on our knowledge of the industry, and we see an opportunity for improvement.” That’s how a C-level conversation gets started, and then we get into due diligence which helps us create a business case for the customer. And after that we pretty much see a sole source engagement happening. In some verticals like manufacturing and retail where there is a strong sourcing organization, they still undergo an accelerated sourcing process. But most of the contours of the deals are shaped during demand creation, rather than during the vendor evaluation process. Phil Fersht: So what’s changed since the Recession has faded, and how is the new, less conservative mindset impacting your business? Abid Ali: Let me answer this from two perspectives. On the buyer side I am seeing much more certainty. A year back, survival was the big thing, so the decisions being made could have been more tactical than strategic. Today, we are seeing customers coming out of the Recession already thinking about how they will cater, not only to the growth that is going to happen in the next two or three years, but also how to be better prepared if they were to undergo a similar Recession three years from now. And obviously, since organizations like TCS were such a strong part of the solution to the challenges clients had, they are now engaging with us on a more strategic basis. This also means we are getting to try newer things we would not have been given a shot at earlier, and all of the vertical transaction processing, vertical BPO, platform transformation etc. is part of that. We’re also seeing smaller deal sizes. We’re also seeing more pilots that start with a model where their own in-house staff is the “champion” and we are the “challenger”, do part of the processing and then they have a roadmap over the next year or 18 months to scale it up. Risk becomes an important criterion on the buyer’s side as we do that. They understand there’s a huge component of learning custom processes, but they are very focused on whether we have the right risk and control mechanisms in place. And a process-centric organization like TCS does have a significant advantage with the risk and controls, quality, tools and ecosystems, which enable better process capability and delivery. On the supplier side, we are making more investments in our global delivery network. We have delivery centers in the US, the UK, India, Mexico, Chile, Uruguay, Brazil, Ecuador, Budapest, the Philippines and China. Some of our more recently added sites – such as the Philippines and Michigan – were a direct outcome of everything we learned through the Recession and the political dynamics that come into focused play during an economic hardship. Phil Fersht: As you build out globally, is it in response to the way companies are morphing their shared services? Two or three years ago, people were talking about the death of shared services, but clearly that hasn’t happened. What’s your view on the future development of shared services and how it ties into BPO? Abid Ali:Client organizations are still investing in shared services. On one end of the spectrum, there are companies that have done shared services earlier, and are looking at the next wave of value, and that is where BPO is becoming more compelling to them. There has been mixed success of process standardization and process transformation in internal shared services, where, for example, four separate P&L managers are hiring four different teams in those shared services, and they may be able to put in some common recuiriting processes, for example, but all these services are being directly controlled by the end-user. They have delivered consolidation and a certain amount of labor cost arbitrage, but they have not necessarily delivered IT-led transformation. So the next wave we are seeing, is where the customers are coming to us saying, “We have put the shared services together, now either can you take it over, or partner with us to deliver IT-led transformation and the next wave of business effectiveness and process efficiency to it.” So that is one side of the spectrum. The other side today, is where some customers are embarking on a two-stage process, where the first stage of doing vertical BPO is actually creating their own shared services and consolidating processes in their shared services. So I don’t think shared services is over. In many cases today, we actually see shared services as an enabler for an eventual BPO. I would partner early on with the client and encourage the movement to shared services, because a lot of times doing direct BPO from a current state, may not necessarily be manageable by a third party provider because of the amount of change that needs to be driven within the client organization. I see this as a continuum with shared services and BPO on two different ends and many stages in between. 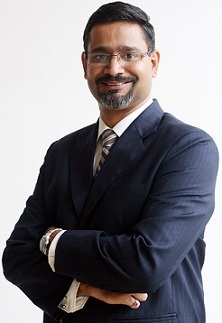 Abid Ali Z Neemuchwala (pictured), is Global Head for BPO Services and Process Excellence for Tata Consultancy Services. In his 17-year TCS career, Abid has been executive sponsor for a number of key clients of TCS. He is a director on the board of TCS eServe Limited. Earlier, he managed TCS’ operations as Regional Manager for the Midwest US and in Japan. He currently lives in Dallas with his wife and 7-year old daughter.